Consistently getting a great night’s sleep is a game changer when it comes to your overall health. Your weight, ability to fight illnesses, blood pressure, and a boat load of other health factors are directly impacted by your sleep patterns. So, if you aren’t a solid sleeper, it’s time to get back on track. To help you out, we have a “Sleep Quiz” that can identify some of the usual sleep destroyers. If you have a hard time getting a restful eight hours on a consistent basis, take this quiz, and when you answer “No,” think about adjusting your behavior. With a few tweaks, you’ll be sleeping like a baby. If you have any other tips to get a great night’s sleep, we’d love to hear them! Just post them in our comments, and we’ll share them with the world. Here’s the deal; we spend A LOT of time at work. On a standard business day, the average American working adults spends about 8.8 hours at their workplace. That’s more than half of your waking hours! While that might be a little super depressing, if you look at it with a “glass half full” point of view, there’s a big time opportunity; to get healthy at work! Since we spend so much time at work, workplace wellness has become more important than ever. For most of us, our post-work obligations trump things like exercise, preparing healthy meals, and stress management. But if you can use those 8.8 hours and incorporate healthy activites into your routine, you can make some big strides toward healthy living. If you’re looking for an organization that has embraced this concept, our pals at Oregon Medical Group are a perfect example. Oregon Medical Group is a medical provider that has clinics throughout Eugene and Springfield (Oregon), and their motives for workplace wellness go beyond just having healthy employees. Since they’re caring for patients and asking them to make healthier lifestyle choices, they felt a responsibility to serve as an example in our community. What is Oregon Medical Group doing to promote healthy living among employees? Oregon Medical Group’s primary focus is about as simple as it gets; they’re encouraging employees to walk more. Using pedometers and incentives for tracking their daily steps, they created a culture of competition, teamwork, and fun within the organization. The goal for a healthy adult is to take about 10,000 steps every day. 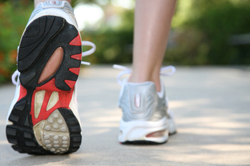 While the primary focus of Oregon Medical Group’s wellness promotion is around walking, any steps can count. So if employees wear their pedometers for things like sports, Zumba, running, hiking, etc. they’ll increase their chances at earning incentives. You bet it is! Their success stories are phenomenal, and their walking program has garnered some attention in the media. Eugene based newspaper, The Register Guard did a full profile of the program. Check out the article here: Good business moves: Companies help employees stay in motion to improve health. We’re so thankful to have partners like Oregon Medical Group, and we were thrilled to see their walking program get the positive attention it deserves. Let’s hope their positive example spreads throughout Eugene/Springfield. Keep on stepping, Oregon Medical Group!